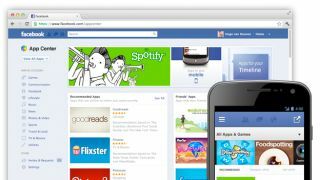 Facebook has launched a new App Center to help users find exciting new Facebook apps and games to use on the social network. It comes with personalised app recommendations among its 600+ apps, as well as the ability to nose through and ruthlessly copy games and plug-ins your pals are using. You'll be able to preview the apps from the App Center before you install them too – which includes an overview of the privacy settings and allowances each app needs. The App Center looks a lot like iTunes, if we're honest, and is in a similar vein to Spotify's App Finder - but unlike the music service, Facebook's Mobile apps are also getting access to the App Center. At least, the iOS and Android apps are, allowing for apps to be sent from the desktop to your mobile device, as well as letting you browse the catalogue from your phone. US-based Facebook users will start seeing the App Center in their Facebook menus from today, while the rest of the world should get it over the coming weeks. It's all part of Facebook's grand plan to have you document the minutiae of your day-to-day life in your Facebook Timeline, including the song's you listen to, books you read, movies you watch, food you cook, people you stal... wait, no, we mean friends you're closest to and basically every mundane thought that runs through your mind. We remain unconvinced.